"The pearls happened because I have a big hollow here in my neck," Mrs. Billingsley told the Los Angeles Times in 2003. "In those days, cameras and the film weren't as good as they are today, so I used to wear different kinds of jewelry around my neck to hide that spot. . . . So no matter what I was doing - cleaning, cooking or answering the phone - I had those darn pearls on." The high heels also had a reason. "In the beginning of the series, I wore flat shoes, but then Wally and the Beaver began to get taller," she said. "That's why they put me in heels. The producers wanted me to be as tall or taller than the kids. Sometimes I would stand on the stairs for a scene so I could have some more height." Born Barbara Lillian Combes in Los Angeles in 1915, she moved to New York in 1937 to take a role on Broadway in a show that closed after 4 performances. But she stayed, supporting herself as a model and sometime-actress before marrying Glenn Billingsley and having two kids. They moved back to L.A. in the mid-forties, where Glenn managed a club and Barbara got a contract with Metro Goldwyn Meyer that earned some bit parts in movies. She and Glenn divorced in 1947. She continued working in movies and then television, earning bit parts for a couple of years. 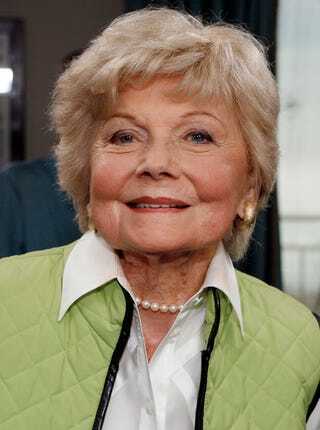 She married director Roy Kellino in 1953, and later picked up two decent sized television sitcom roles: first, as the wife of a child psychologist played by Stephen Dunne on the sitcom Professional Father; then as the girlfriend of Gale Gordon in The Brothers. Kellino died of a sudden heart attack in 1957, leaving her sad but, as she told the LA Times, her agent didn't let her wallow in it. "It's a terrible blow, but you can't wallow in your grief," Billingsley said in a 1993 interview with The Times. "When Roy died, my agent made me work all the time. And six months later, they called me to start the series." "The series" was Leave It To Beaver. Al White, one of the actors in the scene, told the Toronto Star that he helped Mrs. Billingsley learn the cadence of black slang. "She was so open and attentive and eager," he said. "She wanted to learn, and she wanted to get it right." The stewardess tells the passengers, "Would you tell him to just relax and I'll be back as soon as I can with some medicine?" Mrs. Billingsley translates, "Jus' hang loose, blood. She gonna catch ya up on da' rebound on da' med side." After that, Billingsley voiced The Nanny in Muppet Babies from 1984-1991; took part in several Leave It To Beaver remakes and sequels; and did out-of-character cameos on everything from Mork and Mindy (and inmate) to Murphy Brown (an overzealous Neighborhood Watch lady). "Barbara was a patient advisor and teacher. She helped me along this challenging journey through life by showing me the importance of manners and respect for others," Jerry Mathers, 62, who played the Beaver from 1957-63, said in a statement. "She will be missed by all of her family, friends, fans and, most especially, by me."